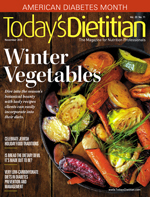 Today's Dietitian shines a spotlight on five of the top winter veggies that clients can easily include in their diets this season. When earthy tomatoes, plump zucchinis, and sweet bell peppers are in season at the farmers' market, it's easy to pump up the volume of fresh produce in one's diet. But, once those last warm rays of summer diminish, many vegetable offerings follow suit. Instead of recommending that your clients purchase fresh produce out of season—shipped from thousands of miles away or grown in heated greenhouses—suggest they switch to seasonal varieties. It's a more healthful, sustainable message. Winter vegetables include those that are harvested late in the season and endure well for a period of time, as well as cool-weather, hardy vegetables that may be grown in more temperate climates during winter. Many of these vegetables were those that once filled root cellars of our ancestors, providing a source of nutrients to sustain people over the long winter. Winter vegetables include root vegetables, such as potatoes, turnips, parsnips, carrots, and beets; allium vegetables, such as onions, garlic, and shallots; cruciferous vegetables, such as cabbage, Brussels sprouts, broccoli, and cauliflower; hardy greens, including kale, spinach, and chard; and winter squash and pumpkins. Today's Dietitian chooses five top winter vegetables—Brussels sprouts, cabbage, parsnips, pumpkins, and winter squash—to focus on this month, asking dietitians to share their best tips on how to encourage clients to embrace these nutrient-rich vegetables this season. "One serving of Brussels sprouts has all the vitamin K you need for the day, which helps lower inflammation and supports bone growth and the cardiovascular system," says Megan Casper, MS, RDN, dietitian and owner of Nourished Bite Nutrition, based in New York City. Casper advises her clients not to overcook Brussels sprouts, as they will lose some of their nutritional value and start to smell like rotten eggs. "Drizzle with oil, cut an 'X' into the core, and roast or try quickly steaming until tender," Casper adds. "I'm obsessed with Brussels sprouts, because they have a mildly bitter flavor and are packed with cancer-fighting sulfurous compounds. I love them shredded into salad and enjoyed raw or halved and roasted until caramelized and crispy," says Abbey Sharp, RD, Toronto-based blogger at Abbey's Kitchen. Though roasting is one of the most popular ways to enjoy this vegetable, they also can be included in stir-fries, grilled vegetable skewers, puréed in cream soups, and served as a side dish with a flavorful sauce. Another member of the cruciferous vegetable family, cabbage—with hundreds of varieties grown around the world—show up as a key feature in many food cultures, ranging from Asia to Europe to Central America. Can you imagine Mexican street tacos without a generous topping of crunchy white cabbage, German cuisine without sauerkraut (fermented cabbage), and Chinese stir-fry without its foundation of cabbage? "Cabbage is high in sulfur-containing compounds, which helps protect against cardiovascular disease, diabetes, and many types of cancer," Casper says. She suggests that cabbage becomes sweeter when it's harvested in cooler weather, and that it's one of the most budget-friendly vegetable buys. "Encourage your patients to try it steamed, sautéed, or chopped into a salad," Casper adds. Additional ways to encourage cabbage intake is to include fermented cabbage (sauerkraut) in casseroles, sandwiches, or as a side dish; shredded cabbage added to a slaw, sandwich, wrap, or taco; Thai- or Chinese-style stir-fries with cabbage served with brown rice; cabbage casseroles, such as stuffed cabbage or slow-cooker cabbage; and in classic soups and stews. One of the lesser-known root vegetables, parsnips deserve more recognition during the winter vegetable season. Originating from the East Mediterranean, these vegetables have a long traditional use in Europe, where potatoes usurped their prominence when the Spanish explorers introduced them from the New World. Pale yellow or creamy colored, parsnips store well in root cellars and pack a nutritious kick into diets. One-half cup of cooked parsnips contains folate (11% DV) and vitamin C (17% DV), as well as fiber and phytochemicals with anti-inflammatory and antioxidant properties. According to Toby Amidor, MS, RD, CDN, a Wall Street Journal best-selling cookbook author, during the first frost this winter vegetable converts its starch to sugar, giving it a sweet and nutty flavor. "Parsnips are also high in vitamin C and [are] a source of folate and vitamin K. Although you typically see parsnips eaten cooked, you can also eat them raw by grating or cutting them into matchsticks and adding to salads or as part of a crudité," Amidor says. She suggests using parsnips in creamy winter soups, as they provide a slight sweet flavor and natural thickening ability; roasting or baking them; puréeing them into a mash; or using them in place of potatoes and carrots in any recipe. Sarah Koszyk, MA, RDN, author of 365 Snacks for Every Day of the Year, also enjoys recommending parsnips in the winter season. She notes, "They are so versatile to cook with and have less starch than a potato." While most of your clients might think pumpkin is relegated to pumpkin spice lattes, jack-o'-lanterns, and pumpkin pie, this winter vegetable has an important history in food traditions around the globe. Originating in North America, pumpkins are a cultivar of the squash plant and have been used in many cultures, including Caribbean, South American, and Asian, where pumpkin is enjoyed in soups, stews, stir-fries, and dumplings. "Pumpkin is an excellent winter vegetable because it's readily available year-round," says Catherine Brown, CDM/CFPP, a chef, culinary nutritionist, and organic grower based in New Hampshire. "I keep it in cans on hand at all times. It's easy to use, and a nutrition powerhouse, with vitamins A, C, E, riboflavin, potassium, copper, and manganese." Brown suggests clients try purchasing whole pie pumpkins, roasting wedges, and serving them as a side dish, or puréeing pumpkin into a silky-smooth pumpkin soup. She says clients also can add canned pumpkin to hot whole grain cereal, chia pudding, or smoothies. One quick way to encourage people to use pumpkins this winter is to start with those they use to decorate their porches and mantles during the fall season. Simply split them in half, remove the seeds (save them for roasting), and bake them as you would other winter squashes. The cooked flesh can be used in soups, stews, muffins, bars, cereals, smoothies, hummus, and more. An array of winter squash (from the Cucurbitaceae family) awaits discovery during the cool weather months, including acorn, buttercup, butternut, delicata, hubbard, and spaghetti squash. The hard outer shell means winter squash can be stored for long periods of time; once split open, they reveal vibrant yellow-orange flesh, a calling card for their rich carotenoid compounds linked with health benefits and disease protection.3 Depending on the variety, these vegetables contain varying amounts of vitamins A, B2, B6, C, and K; fiber; and minerals. Winter squash can be traced back to Mexico. They're an important part of the agricultural traditions of the Native Americans dating back at least 1,000 years, in which maize, squash, and beans—known as "the three sisters"—were planted together, forming the backbone of the traditional diet. "My favorite vegetable in the winter season is squash, rich in vitamin A, fiber, and folate," says Katie Pfeffer-Scanlan, MS, RD, LDN, a clinical dietitian and blogger at One Hungry Bunny. "There are so many beautiful varieties and versatile uses in cooking. Whether it's roasted, sautéed, or mashed, they make an excellent main and side dish." Judy Barbe, RD, author of Your 6-Week Guide to LiveBest: Simple Solutions for Fresh Food & Well-Being, suggests, "Roasted winter squash, such as butternut, hubbard, kabocha, and acorn, can be served as a side dish, then tossed into tomorrow's salad, stirred into pasta with a spoonful of ricotta, or puréed for soup. Cooked squash also freezes well." Elizabeth Shaw, MS, RDN, CLT, CPT, of ShawSimpleSwaps.com, coauthor of Fertility Foods Cookbook: 100+ Recipes to Nourish Your Body, says that acorn squash has become one of her favorite winter vegetables to recommend. "During winter months, when people are notorious for popping vitamin C pills, I enjoy educating on the 'food first' philosophy and including more whole foods in their diet." Liz Weiss, MS, RDN, host of the Liz's Healthy Table podcast and blog, says, "I encourage people to include more vegetables in their diets, and spaghetti squash makes that recommendation easy. This nourishing winter vegetable is versatile, mild in flavor, and fun to eat. Once cooked, I shred it into spaghettilike strands and then top it with all sorts of nourishing ingredients, including beans, sautéed bell peppers, and avocado; pasta sauce, grated Parmesan, and meat-free crumbles; and steamed broccoli and shredded low-fat cheddar cheese." Maggie Moon, MS, RDN, of the blog MIND Diet Meals, likes to showcase winter squash in a Korean dish called hobakjuk, which refers to zucchini or winter squash porridge, but most commonly refers to a porridge that celebrates the sweet winter squash called danhobak (also known as kabocha squash). See a recipe for the latter dish and others that celebrate the bounty of winter vegetables on the following pages. — Sharon Palmer, RDN, The Plant-Powered Dietitian, is a blogger, author of Plant-Powered for Life, and nutrition editor of Today's Dietitian. 1. Royston KJ, Tollefsbol TO. The epigenetic impact of cruciferous vegetables on cancer prevention. Curr Pharmacol Rep. 2015;1(1):46-51. 2. Bacchetti T, Tullii D, Masciangelo S, et al. Effect of black and red cabbage on plasma carotenoid levels, lipid profile and oxidized low density lipoprotein. J Funct Foods. 2014;8:128-137. 3. Zhao LG, Zhang QL, Zheng JL, et al. Dietary, circulating beta-carotene and risk of all-cause mortality: a meta-analysis from prospective studies. Sci Rep. 2016;6:26983. 1. Preheat oven to 400° F. If using fresh pumpkin, wash and dry the pumpkin. Slice the pumpkin in half and scoop out the seeds and webbing. Slice the pumpkin halves into 1/2- to 1-inch wedges. Place on a parchment-lined baking sheet and bake for 35 to 45 minutes, or until soft and browned around the edges. If roasted garlic is preferred, add the 2 large cloves to the baking sheet along with the pumpkin. Set aside to cool. If using canned pumpkin, skip this step. 2. While pumpkin is baking, slice potatoes into 24 1/4-inch slabs. Blot each piece with paper towels or an absorbent towel. Place on parchment-lined baking pans and lightly spray both sides with oil. Place in the bottom rack of the oven with the pumpkin. Bake for approximately 15 to 20 minutes on each side until browned and crisp. Set aside to cool slightly. 3. Remove the pumpkin flesh from the skins, place in a bowl, and mash with a fork. Strain the pumpkin in a fine mesh sieve for 5 minutes to remove excess liquid, reserving liquid. If using canned pumpkin, do this step as well. 4. While potatoes are baking, make the hummus. To your high-speed blender, add the drained and rinsed garbanzo beans, strained pumpkin, tahini, sea salt, garlic, nutmeg, cinnamon, and white pepper (if using). Blend until creamy and smooth, scraping down the sides of the blender as needed. If the mixture seems too thick, thin it a bit with reserved pumpkin liquid or apple cider. Taste and adjust seasoning if necessary. 5. In a small saucepan, melt the plant-based margarine over medium-low heat. Add fresh sage leaves and fry until browned and crisp. Remove onto a paper towel-lined plate. Allow to cool, then crumble. 6. Pipe about 1 T of the hummus onto each of the potatoes and transfer to a serving dish. Drizzle each with sage-infused margarine and sprinkle with the crispy crumbled sage, cracked black pepper, and smoked salt (if using). 1. Bring water to boil and heat up the grill. 2. Once water is boiling, add brown rice, cover, and reduce heat to simmer. Simmer for 30 minutes. Add quinoa. Simmer for another 15 minutes or until water is nearly gone. Turn off heat and allow it to sit and soak additional water for another 10 minutes. 3. Toss squash, Brussels sprouts, and onion in oil. Grill on medium heat, turning occasionally for about 30 minutes, or until vegetables are tender. 4. Combine brown rice, quinoa, vegetables, salt, and pepper in a large bowl or pot and serve. 1. Rinse and drain brown rice in cool water 3 times. Soak rice in clean water for at least 1 hour (can be done a day ahead). 3. Wash squash well, then pierce several times with a knife and place in a large microwave safe bowl with 3 inches of water. Cook in microwave for 4 minutes; flip the squash over and cook for another 4 minutes. Let squash cool enough to handle, cut into 4 pieces, toss with oil, then place cut side down on a lined baking sheet and roast for 20 minutes. Let rest until cool enough to handle, then remove skins. 4. While squash is roasting, make the thickening liquid. Drain soaked rice and add to blender with 1/2 cup of water. Blend on high until liquified, and set aside. Rinse out the blender. 5. Blend the squash in batches, gradually adding 6 cups of water, until smooth. Place blended squash in a large pot and heat on low. 6. Slowly stir in brown rice-water mixture and simmer for 10 to 15 minutes. Remove from heat and salt to taste. 7. Meanwhile, make the mochi (rice cake dumplings). Heat a medium pot of water to boil, and prepare a large bowl of cold ice water. 8. Place rice flour in a medium bowl and stir in 5 T of hot water, gradually, until cool enough to handle, then knead dough for a few minutes. 9. Pinch off 1/2 teaspoon of dough at a time and roll dough to form 30 small balls. 10. Drop balls into boiling water for 1 to 2 minutes, until they float. 11. Remove rice cake dumplings with a slotted spoon and place in cold water bath until ready to use. 12. To serve, pour soup into bowls, add a few rice cake dumplings to each, and garnish as desired. Drizzle with honey if desired. 1. Toss together cabbage, onions, bell pepper, cucumber, jalapeño, parsley, mint, and peanuts in a large salad bowl. 2. In a small bowl, whisk together oil, soy sauce, lime juice, ginger, and agave syrup. 3. Gently mix in dressing and distribute well. 1. Preheat oven to 400° F. Line a rimmed baking sheet with aluminum foil and lightly coat with nonstick cooking spray. 2. Trim the squash stems; cut in half lengthwise and remove the seeds. 3. Brush inside of hollowed-out squash with 1 T of the olive oil, salt, and pepper. Place, hollowed side down, on the prepared baking sheet, and bake until tender, 35 to 40 minutes. 4. While the squash is in the oven, heat the remaining 1 T oil in a large skillet over medium-high heat. Add bell pepper and onion and cook, stirring frequently, until tender and caramelized, 7 to 10 minutes. 5. Stir in beans, cilantro, barbecue sauce, cumin, and chili powder. Heat for about 1 minute. Set aside. 6. Remove the cooked squash from oven and allow to cool about 10 minutes. Shred the cooked squash into spaghettilike strands. Top each bowl with the bean mixture and optional toppings as desired. 1. Stack the spinach leaves, roll them up, and then slice into ribbons. Work in batches if needed. Set aside. 2. In a large pot over medium heat, heat the olive oil and sauté the onions, carrots, celery, parsnips, and turnips for 4 minutes. Add the beans and stir to combine. Add the vegetable broth, mirin, and bay leaves, and stir to combine. Increase the heat to high and bring the liquid to a boil, then reduce the heat to low, cover the pot, and simmer until the vegetables are tender, about 20 minutes. — Source: Toby Amidor, MS, RD, CDN, The Healthy Meal Prep Cookbook: Easy and Wholesome Meals to Cook, Prep, Grab, and Go, Rockridge Press, 2017. Photo courtesy of Nat & Cody Gantz.